Size: -8 5/8" tall X 28 1/8" wide. 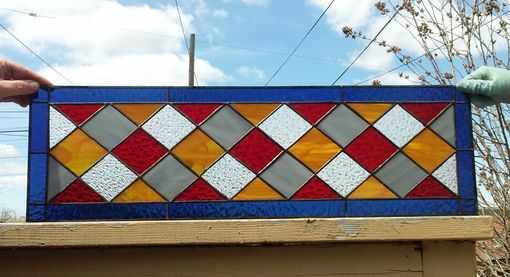 Glass: Glass border is medium blue textured transparent, diamonds are clear Crystal Ice texture, Medium Grey opal, Ruby Reg granite and Honey Amber wispy opal. If simplicity is what you are looking for, you are in the right place!! !